Lead your school to success by creating a strengths-based culture. Gallup's K-12 Education experts can help you build highly engaged school communities that increase performance outcomes. Great teachers see students as unique individuals and create environments in which those students thrive. Gallup's 40 years of research in thousands of school districts nationwide helps schools find candidates with the right talents for the job. Find the best potential leaders for your district with our research-based talent assessment. Discover the leading candidates to ensure that you have high-talent teachers in every classroom. Use this assessment to select the most talented support staff to create an atmosphere of success throughout the district. The nation's most successful and engaged schools have teachers and employees who are engaged -- meaning they are involved in, enthusiastic about and committed to their work and school. Increase the value of your students' learning experience by creating a great place to work and learn. Inspire your high school students to thrive in school by doing what they do best to plan for college and careers. Unlock your 10- to 14-year-old students' potential with the Clifton Youth StrengthsExplorer assessment, helping them focus on what they do best to succeed on their journey to live better lives. How students feel today affects how they will perform in the future. Learn what your students are feeling about their school experiences by measuring what matters most for student success. Optimize your staff's, school's and district's performance with Gallup's employee engagement offerings. Equip your staff with strategies to create a culture of coaching toward higher levels of performance. Discover ways to transform your school's culture by focusing on what's right with each employee. Highly talented teachers and leaders want to work for school systems with a strong district identity. Parents send their kids to a school they are proud of -- one that delivers on what it promises. This sense of pride and engagement in one's school has a direct impact on the community. Discover a comprehensive plan for inspiring new behaviors and beliefs in your school district. The most successful districts have a clearly defined and highly committed culture. A district's identity -- a combination of its mission, brand and culture -- is what sets it apart from the competition. This identity is the reason why highly talented teachers and principals choose to work for one school system over another. Gallup can help you discover new ways to align your school's purpose, brand and culture. Gallup's strengths-based development courses for educators and our professional development courses provide strategies to create thriving students and schools. These courses are the perfect accompaniment to CliftonStrengths for Students and StrengthsExplorer. 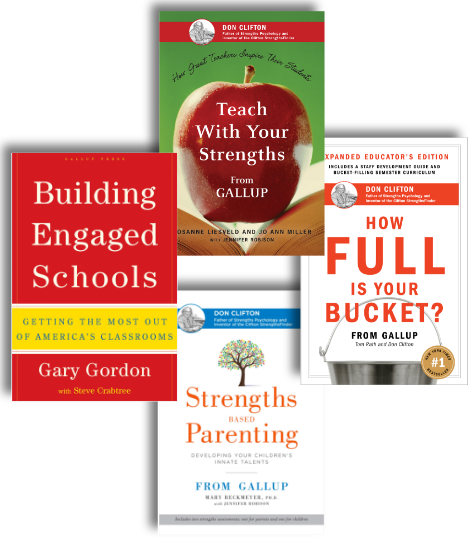 From bestselling books that include valuable resources, techniques and inspiration to group codes for CliftonStrengths assessments to interactive toolkits and action packs, Gallup provides a vast collection of education tools, products and services for you. Find the path to revamp your school's culture.